The action bar is located in the top center part of the Submission correction page. When a submission is ready to be registrered, by clicking on the [Register] button, the manual registration process is initialized. Before registering a structure or data (CST), the compound is first validated, checked, fixed and standardized. These procedures are the same as described in the Autoregistration chapter . Finally, the match search is performed. On the Submission page, prior to registration, we have the opportunity to save a submission, that was modified. E.g. we can change the structure, even several times, and after each change we can store (save) the submission (but not register it). A saved submission will have a "SavedSubmission" status in the Staging area or Submission page. If the record is not yet registered (e.g. the previous user did not complete/register the record), and there are available several saved changes for the given submission, a previous version of the submission can be restored. When clicking on the [Restore] button, a [Restore submission window] appears, containing all available versions of the current submission. The window has two columns. On the left side, the "current state" of the submission is displayed (not necessarily the last saved one), whereas on the right side a "history" list of the saved previous versions is displayed. The window contains information about the LnbRef, Modification date and Opened by. 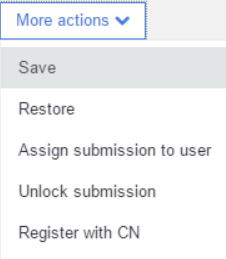 After choosing a state, we can restore it, by simply clicking on the [Restore] button located in the bottom right side of the Restore submission window. A window is opened, where a user can be selected, who the selected submission will be allocated to. By choosing this option, the opened submission will be released, it will be possible to be freely edited (i.e. without warning messages) by any other user. 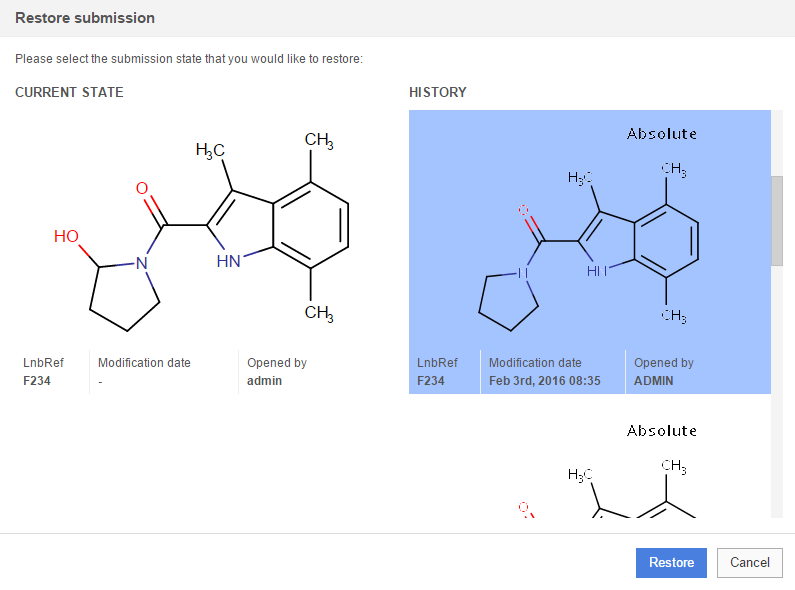 It is possible to register a new lot under a given version (CN) without supplying the structure and/or CST and optionally salts/solvates. In order to do this, only external IDs (LnbRef, lot ID, if needed) and source fields have to be supplied, then the [Register with CN] option should be clicked and in the appearing Registering structure window the desired compound number (CN) should be entered. Next to the mandatory fields, additional data (e.g. Purity, QC, Project etc.) can also be supplied, which will be saved as lot level additional data. The Project name, supplied for the lot, will be inherited by the version and the parent too. Stereochemistry and Geometric isomerism data are not stored. After applying a checker-fixer, it can be useful to view the effect of it on the structure. For this, use the [Check] button located in the top right part of the structure editor. As a result, a hit list will appear, which shows the structure to be registered with the appropriate structure fixers already applied. This structure will be the same as on the match list during the real registration. This window is only for inspecting the hits, no action buttons are available.